Serious outdoors enthusiasts—the type who get up before the roosters, eat locusts and honey, and start campfires with their bare hands—might not want to tote a GPS locator in their knapsack. But with a little help from MacGPS Pro 8.3 software, a handheld GPS receiver, and a couple of AA batteries, the journey doesn’t have to be quite as primitive. 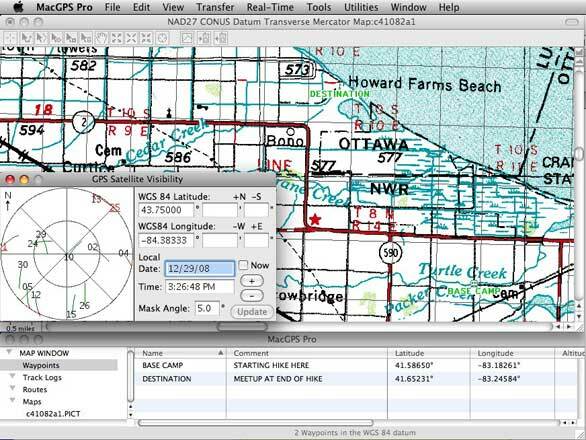 MacGPS Pro helps you plan and catalog your outdoor trips using your Mac and a handheld GPS navigator. This software is geared towards campers, bikers, hikers, and boaters. It can also be your secret weapon in the GPS-enabled treasure-hunting pastime known as geocaching, or you could use it to measure the travel speed of each leg along your route. All the routes, tracks (logs of the places you’ve been during your trip), and waypoints (places of special interest) that you record with MacGPS Pro can be visualized in the software’s map window. A separate window displays your routes, tracks, and waypoints, so you can review elevations, travel speeds, and routes in a concise list. Also provided is a visual indicator of current GPS satellite positions and readings. Opening maps is a snap. Based on your current GPS location, you can auto-open a map of your immediate surroundings, or you can open a map by using the U.S. Geological Survey (USGS) quad name—a rough reference to the region covered on a particular map. When you enter a quad name for a particular map scale, all the available maps that overlap the location in other scales are suggested automatically, so you can open any of them. The USGS’s standardized scales are all available. Once you open a map, navigating it and tagging routes is straightforward. MacGPS Pro makes it simple to measure distances by dragging across the map’s surface, and adding waypoints takes a single click. The maps are available in raw form via the USGS’s Web site. Since MacGPS Pro ships with only a few sample maps, you’ll want to obtain some more to get started. James Associates’ MacTopos DVDs contain detailed maps in a variety of scales and locales. These maps, from the same vendor as the software, are ready to use with MacGPSPro. The easiest way obtain them is to order from the company. MacGPS Pro works with raster-based maps, from those produced by the U.S. Geological Survey and National Oceanographic and Atmospheric Agency to those that you draw and scan yourself. As you travel, your GPS receiver collects location coordinates and elevations. You can capture data to MacGPS Pro in real time or carry it on your GPS’s internal memory for later importing. During a trip, you can notate waypoints and update tracks on the receiver, and then dump the information into MacGPS Pro using a USB connection. If you’ve found a particularly good fishing hole or a cave you want to explore on a later trip, MacGPS Pro will keep it as a waypoint for future trip planning. Each waypoint can be linked to a file or a URL. This makes it easy to attach a photo or take additional notes about a particular spot, though it’s disappointing that you can’t attach more than one photo to a waypoint, or link an iPhoto event with a waypoint or track log. Perhaps the biggest difference between MacGPS Pro and its Mac cousins RouteBuddy and RoadTrip is its use of raster-based maps as opposed to vector-based ones. As a result, the maps presented in MacGPS Pro don’t have the polished, highly zoomable quality of the other mapping programs. The advantage of MacGPS Pro’s raster approach, however, is that just about any map—even hand-drawn ones—can be scanned, geo-referenced, and used by the software. Those interested in scientific or exploration-related uses can work with the entire bounty of existing raster-based maps, such as highway maps, topographical maps, or maritime charts. MacGPS Pro’s strength lies in enabling you to meaningfully interpret data about the progress of a journey, regardless of terrain. It’s very easy to compare distances traveled against elevation in a track log or route, for example. It’s fun to plan the amount of time an uphill hike might require, and then graph it visually. It’s even more fun to review the graph of your achievement after you reach the peak. The software supports handheld GPS navigators from Garmin, Magellan, and USGlobalSat, so locating a compatible GPS at local retail should not be a problem, but you should still check James Associates’ compatibility list before making a receiver purchase. Some handhelds, like Garmin’s entry-level ETrex H, are not supported. Others provide a serial interface and require a USB-to-serial conversion cable to connect to the Mac. MacGPS Pro has more trip logging features than competitor RouteBuddy, so its learning curve is understandably steeper than RouteBuddy’s. But MacGPS Pro’s appearance is the least polished of most current Mac mapping software available, and its user interface is occasionally aggravating, too. Depending on the map's position on the screen, it's too easy to accidentally hide the window that allows you to edit waypoints behind the map window. It would also be handy if you could quickly launch a Virtual Earth or Google Map location alongside MacGPS Pro’s map view. Those nitpicks aside, MacGPSPro is a stable application that provides raster map support—a unique feature that could be the deciding factor if you have serious research, maritime, or custom mapping needs. For the GPS enthusiast, MacGPS Pro 8.3 doesn’t offer the prettiest look and feel and has limited value for road navigation, but its raster map support and distance-elevation graphing features could be invaluable to the serious traveler or explorer.